“Accord volontaire”: The government announced to review the current voluntary agreement (ending in 2021) before signing a new one. Against the background of increasing marginal costs of energy efficiency gains as well as the growing investment needs to tap into new energy efficiency potentials, it is the objective of this project group to elaborate propositions for the design of a post-2021 agreement reflecting this new reality. Energy efficiency obligation scheme: While obliged parties (electricity and gas providers) are struggling to reach their energy efficiency (EE) goals, the due penalties for underperforming on the EE goals have discouraged foreign energy providers to stay in or enter the local market. The result is a competitive situation in the energy-providing sector that can be considered a quasi-monopoly. This project group will discuss options and instruments that can improve the competitive situation while improving the energy efficiency performance of the obliged parties. Who should participate: FEDIL members participating in “Accord Volontaire” or subjected to the obligation scheme. i. Short term: The EU Commission is currently working on updating the State aids guidelines for EU ETS. 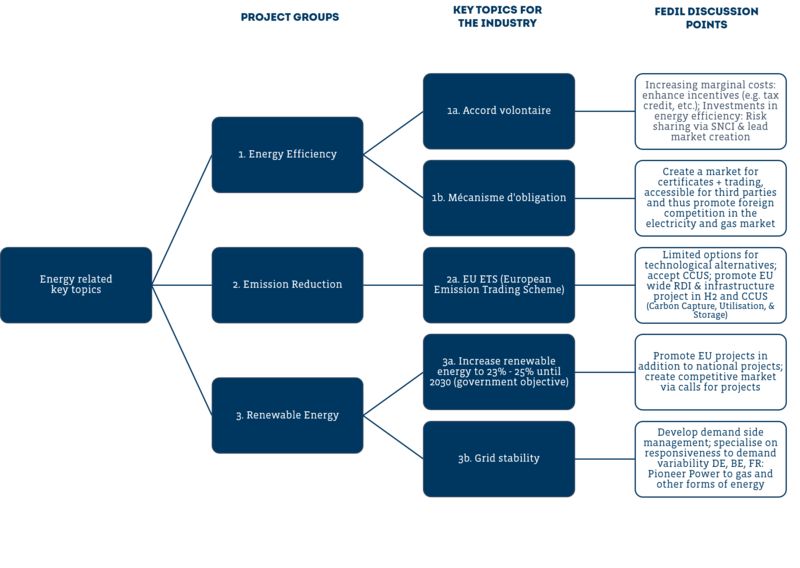 These guidelines define how EU Member States can compensate companies in sectors with high electricity consumption for parts of the higher electricity costs arising from the EU ETS. FEDIL wants to make its members’ voice heard during the current public consultation for the update of those guidelines. This project group thus wishes to gather feedback from its members on past experiences with state aids and to discuss how they shall be adapted for Phase 4 of EU ETS from 2021-2030. More information about the public consultation here. ii. Long term: To effectively keep the interests of energy-intensive industries (EIIs) on the political agenda. FEDIL thus needs to stay up-to-date about how companies cope with the constraints of EU ETS and how the reporting procedures and mechanisms are performing. FEDIL intends to feed a dashboard with key figures and information related to the impact of EU ETS on Luxembourg’s industry. This dashboard will enable FEDIL to assess and discuss the benefits and limitations of EU ETS and to draft propositions for its adaptation. Luxembourg’s government plans to massively increase the amount of renewable energy within the country’s energy mix. Compared to 2016, in 2030 it is intended to increase the national wind energy production by over five times, and solar energy production by over ten times. Such objectives not only require new surfaces to install the additional production capacities but also require the development of the physical electricity grid as well as demand side flexibility potentials to stabilise it. A further contribution to the transformation of the energy mix derives from international renewable energy-based power purchase agreements by large consumers. In many aspects, the industry is directly concerned by the increase of renewable energy production. This project group aims to anticipate and discuss the opportunities and risks of a massive increase of renewable energy production in Luxembourg. A position will be elaborated and will be brought to the attention of decision makers. Contact Gaston Trauffler for more information.